Three Graces wish you a safe and happy New Year!! Exhaustive internet searches and extensive practice has led us to another chapter in the Candle Chronicles - Custom Packaging. Our candles are now neatly tucked inside these boxes wrapped with elegant black satin ribbon and fastened with a wax seal featuring the Graces themselves - fabulous fragrance and form! I've decided to close the gallery at 4:00pm today as it is Christmas Eve, the past few weeks have been exhausting! I have seven minutes left, so I would like to take the time to wish everyone a lovely holiday with family and loved ones. Eat, drink and be merry! 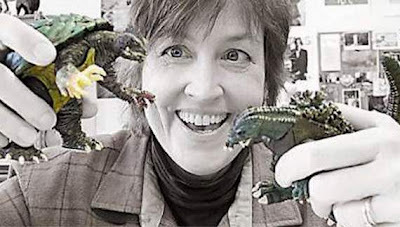 Three Cheers for Carey Armstrong-Ellis, children's book illustrator and soft-sculpturess, for her recent profile in the Portsmouth Herald!!! Read all about it here. Carey's ornaments (Puss in Booties and Squidman with Removable Eyepatch) are now available in the gallery along with many other unique ornaments made by gallery artists! Form and Function - and Fragrance! 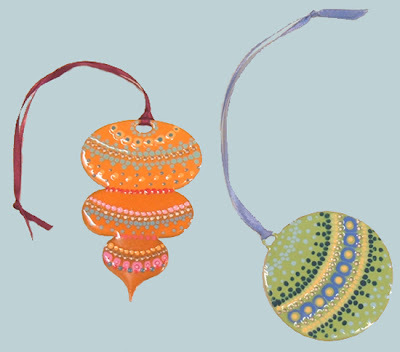 Three Graces presents one of a kind, handmade ornaments by nine different artists! Ron Tuveson has created gilded ball ornaments. Ron specializes in hand crafted frames and restoration. 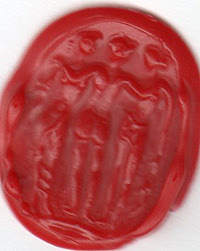 He chose the ball shape as it is prevalent in the history of frames. The balls are available in 4 different sizes ranging from 1.25" to 2.5" and each is gilded with 23 carat gold! The striping is achieved thru selective burnishing. 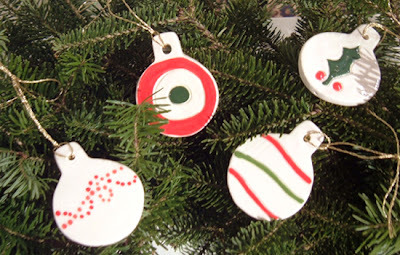 Erin Moran, proficient potter and jewelry designer, has made these reversible porcelain ornaments. Erin has come up with over twenty different designs featuring holiday images and bold patterns and swirls. 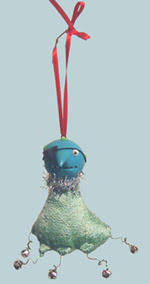 Carey Armstrong-Ellis, highly acclaimed children's book illustrator, has created two ornaments for this holiday season; they are "Squid man with Removable Eye patch" and "Puss in Booties". 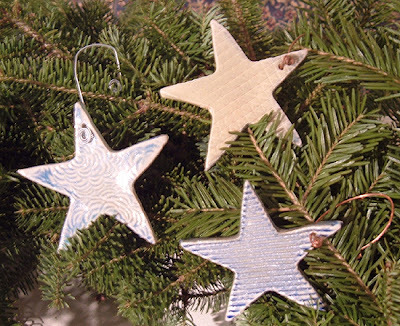 Sarah Burns, potter and sculptress, delivered some beautiful porcelain star ornaments featuring stripes and swirling patterns carved into the surface of the clay. Sarah also recently delivered some new vessels and functional pottery. Sara du Long has created these gorgeous copper ornaments, painted with the same epoxy pigmented resin seen in Sara's innovative jewelry designs. Sara's jewelry is also available in the gallery - she just dropped off some new work the other day! 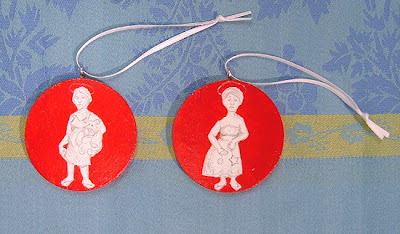 I created these ornaments below - the figures are lifted from my series series of self-portraits as saints . Each ornament is graphite and acrylic on wood. 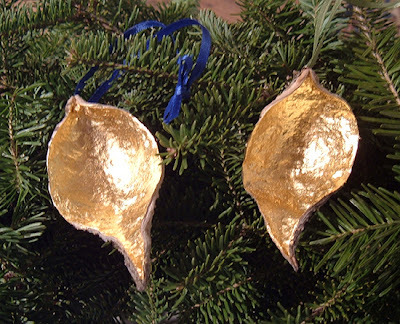 Jared Tuveson (Ron's son) made these gilded milkweed pods, also gilded in 23 carat gold! 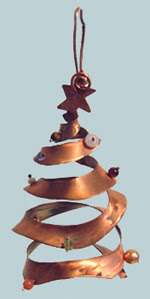 Elaine Ware (sister of Erin Moran) created many different ornament designs using copper and gem stones. Here is one of my personal favorites - the Christmas Tree! 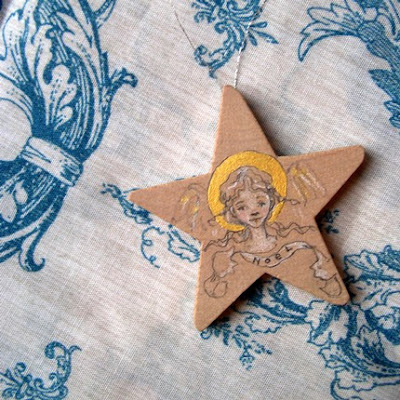 Illustrator Abbigail Halpin dropped of some of sweet little angel ornaments. 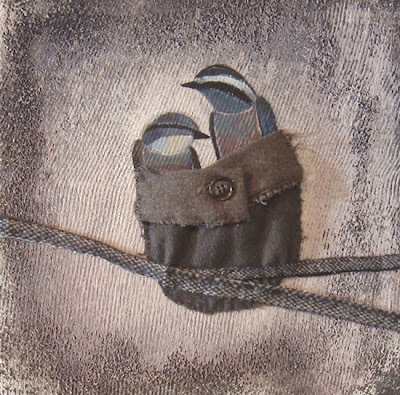 Three Graces welcomes the warm woolen paintings of Tiffany Torre. 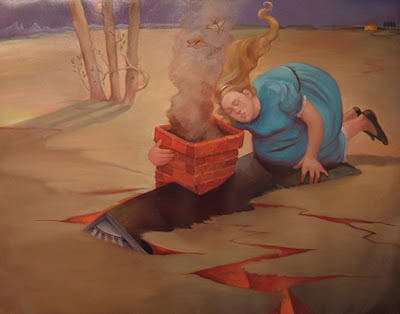 Based in Vermont, Tiffany recently made the trip to Portsmouth (she exhibited paintings at the Button Factory Open Studios alongside friend and furniture maker George Beland.) 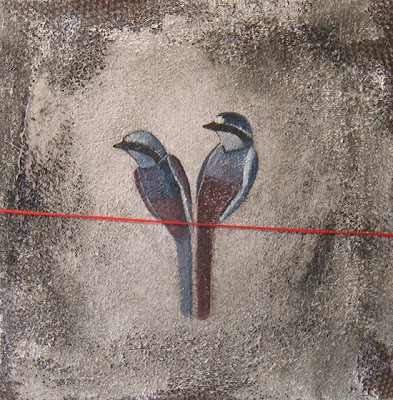 I immediately fell in love with her paintings - genuine and innovative in form and content. 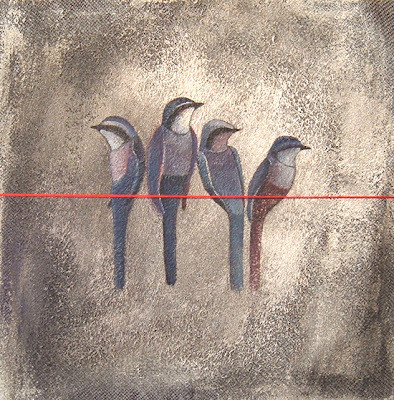 Tiffany focuses on wild critters including birds, rabbits, foxes and also the landscape. The paintings have a beautiful surface texture resulting from Tiffany's technique of painting with oil on wool (she has been working this way for over 10 years!). 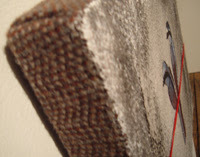 The front is primed however the natural weave of the wool is left exposed on all four sides creating a soft transition. What Came First, The Rabbits or the Paintings? I am leaping with joy! 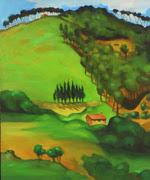 Three Graces is exhibiting paintings by Fleur Palau (known well for her Rabbit paintings and Italian landscapes). 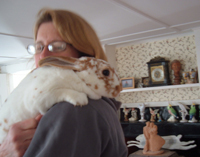 Here she is with her muse, Amber, one of her six beautiful rabbits. Fleur received training in both New York and Florence, Italy. She has lived and worked in Italy for over 20 years where she maintains a home and working studio. 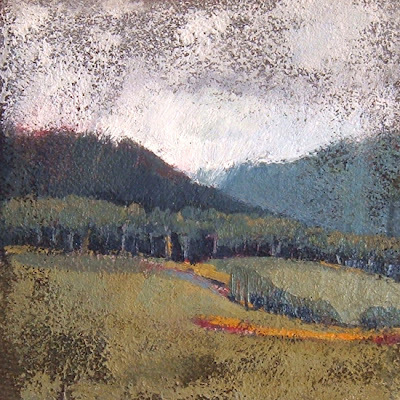 I recently visited her current studio in Wolfeboro, NH and picked up some paintings! 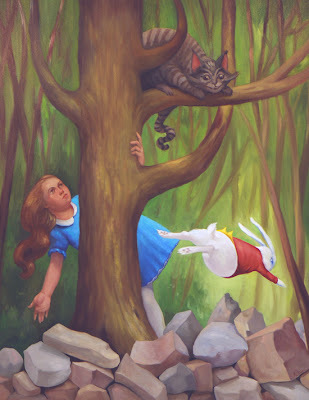 The Rabbit series is a whimsical, yet sometimes moody reflection of the human psyche set in the natural world. The full meaning of these paintings is of course open to speculation and does not concern me, though I recognize the symbolism and irony that is the vehicle in which to reveal some useful message about ourselves. 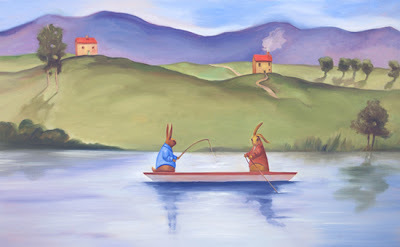 I would hope that in these rabbbit portraits we may recognize the better attributes of our own nature, that of love, friendship, loyalty, and that the renewed recognition of this will at once empower and inspire. 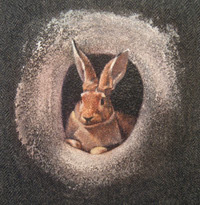 Fleur is also working on a book project featuring some of her rabbit paintings. More about this in a later post!